Mitsubishi Heavy Industries, Ltd. (MHI) held a ceremony at Shinagawa Intercity Hall in Tokyo to formally welcome new employees joining the company this year. 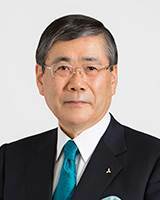 President and CEO Shunichi Miyanaga addressed the new recruits, about to begin new lives as productive members of society, both as head of one of Japan's leading manufacturing companies and, on a more personal level, as an experienced participant in society. He indicated how they should prepare themselves to serve as MHI employees and expressed his high hopes and strong expectations for their future achievements. Miyanaga began by presenting an overview of MHI. He related how the company traces its origins to 1870, the year when Yataro Iwasaki founded a firm called Tsukumo Shokai. Company operations got under way on full scale, however, in 1884 with the establishment of the Nagasaki Shipyard & Machinery Works. In the 132 years since then, MHI, together with its more than 300 Group companies in Japan and worldwide, has consistently conducted business with a firmly embraced mission to contribute to social and industrial development. Miyanaga next introduced some of the Company's most recent achievements: namely, its participation in an offshore wind power generation project in the United Kingdom that will ultimately deliver the world's largest power output, and in the Doha Metro project - one of the largest of its kind in the world - to create an urban transport system in the State of Qatar. In addition, as a brilliant example of new value being created leveraging the MHI Group's comprehensive capabilities - its foremost strength - Mr. Miyanaga related how the MRJ (Mitsubishi Regional Jet), which will be Japan's very first passenger jet, successfully completed its maiden flight last November. The President then shifted focus to explaining how the MHI Group today is pursuing new strategies and initiatives outside its conventional framework in its quest to accelerate global expansion and achieve a business scale of 5 trillion yen as early as possible. He told his new employees about the launch one year ago of MHI's 2015 Medium-Term Business Plan. Mr. Miyanaga further spoke of the organizational structure reforms that have been undertaken, i.e. the consolidation and restructuring of what had been nine business segments into four new business domains: Energy & Environment; Commercial Aviation & Transportation Systems; Integrated Defense & Space Systems; and Machinery, Equipment and Infrastructure. He next noted that starting in April a new Engineering Headquarters has been established to enable the entire MHI Group to undertake large-scale projects. Miyanaga also described how last year, as the highlight of the Company's growth strategy focused on proactive collaboration with other companies and acquisition of other businesses, a joint venture had been formed with Hitachi, Ltd.: Mitsubishi Hitachi Power Systems (MHPS), targeted at becoming a world leader in the field of thermal power generation systems. He also related how last year MHI joined forces with Siemens of Germany in the metals machinery business with the establishment of Primetals Technologies. That move, together with plans to integrate businesses in material handling equipment - especially forklift trucks – engines and turbochargers, is aimed at strengthening the competitiveness of the MHI Group as a whole. Mr. Miyanaga further informed the new employees how MHI, in conjunction with its 130th anniversary, today is undertaking a broad palette of activities to promote more active participation by females and greater diversity. The President next spoke of MHI's sense of values. He introduced the new recruits to the Company's Corporate Identity statement: "Our Technologies, Your Tomorrow." "These words reflect our strong aspiration to be a company that continuously contributes to the realization of a sustainable society on global scale through corporate activities of worldwide scale focused on the Earth's environment," he told them. And he described how MHI, as a manufacturing firm, seeks to use its technological expertise and strength in engineering to solve the many issues the world currently faces, in order to make people's dreams and wishes come true in exciting ways. Next, the President introduced his new employees to MHI's corporate creed, which consists of three commitments. The first is: "We strongly believe that the customer comes first and that we are obligated to be an innovative partner to society." In this regard, Mr. Miyanaga said that all MHI employees should take pride in, and gain fulfillment from, responding to customers' needs and contributing to social progress. Second: "We base our activities on honesty, harmony, and a clear distinction between public and private life." In this context, the President emphasized the Company's commitment to proactively carry out its social responsibilities by pursuing greater transparency in its business operations and adhering strictly to rules of compliance. Third: "We shall strive for innovative management and technological development from an international perspective." Here, Mr. Miyanaga said that the MHI Group's mission is to continuously strive to maintain its management and technological strengths at the world's highest levels, to help Japan be a technologically driven nation; and he added that now, more than ever, is the time for all employees to work together to put this commitment into practice. Finally, the President described how the new employees should prepare themselves for taking up their new jobs. To begin, he encouraged them to be good members of the Company and good members of society worthy of global respect. By devoting their energies to their work and always being attentive to the customer and fellow workers, Mr. Miyanaga offered, their worlds would expand and grow more profound. He also exhorted them to continue studying English so that they can communicate with people around the world. Second, Mr. Miyanaga encouraged the new recruits to become professionals of astute depth. He said that true professionals have a deep understanding of their work and perform their duties faithfully and with attention to detail – factors that, once they become routine, enable the ongoing acquisition of experience as their jobs become increasingly more profound, expansive and complex. The President further encouraged his new charges, besides acquiring special knowledge, to enhance their leadership capabilities, to become professionals who are trusted and respected. Lastly, Mr. Miyanaga advised the new recruits to pursue healthy lives in both body and mind. By paying attention to both of these aspects of life, the President exhorted them to seek out well-balanced professional lives.